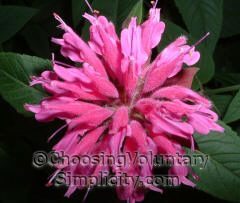 Bee balm (Monarda didyma), commonly called bergamot, is also known by the names oswego tea and horsemint. A member of the mint family, this hearty native American perennial grows up to four feet tall and has thick square stems with lance-like, toothed leaves that grow opposite each other. Bee balm will grow in almost any soil, but it does best in moist soil that is rich in organic material. It prefers full sun or partial shade (plants grown in mostly shade will become spindly). Bee balm has a tendency to mildew, but this can be controlled by giving the plants a location with plenty of good air circulation. 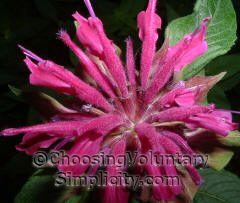 Bee balm can easily be propagated by division in either spring or fall. It can also be propagated by stem cuttings (take the cuttings in late spring, remove all but two leaves, dip in rooting hormone, and plant in sand). It is also possible to start new plants with seed, but because bee balm cross-pollinates so readily and most of the newer varieties are hybrids, the resulting seedlings will not be exactly like the parent. Seeds should be planted within two years after harvesting or they will lose their viability. 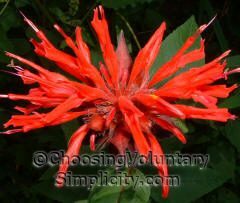 Bee balm is very aromatic and has a spicy, citrus-like scent. There are many different varieties with a range of flower colors including white, red, pink, and purple. The flowers can be single or double, and often a smaller flower will form at the top of a larger one. Bumblebees, butterflies, and hummingbirds love the tubular flowers, although honey bees are unable to reach the nectar. I have a lot of bee balm growing in my gardens. Some were purchased plants, but many came from purchased seeds or seeds I collected myself, which has resulted in many shades of reds, pinks, and purples. Bee balm can be a very invasive plant and the roots spread out rapidly. Because the centers of the plants have a tendency to die out, plants should be divided about every three or four years and the dead centers discarded. You must have a green thumb! All of your plants look so healthy. 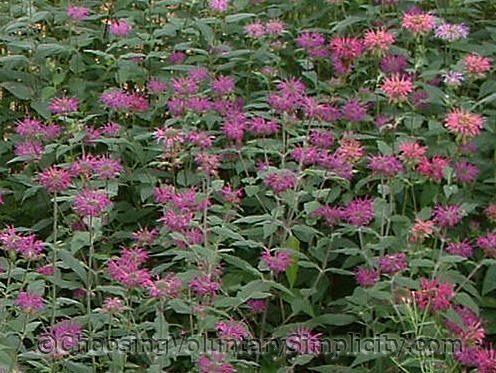 I was looking for information about beebalm and found your site. I will be back! I have some monardia plants but I can see I haven’t been giving them the right growing conditions. I am going to move them now. Great information, thanks. You always have such beautiful pictures. I agree you have to have not a green thumb but a green hand! LOL I enjoy reading your blog very much. I didn’t know you could start bee balm with your own collected seeds. 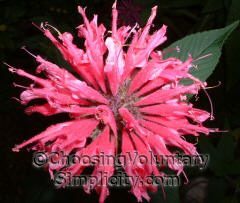 Would you do an article sometime on how to collect bee balm seeds? I presume the seeds are in the flower heads but i have never seen any seeds there. Jim, yes, the seeds are in the flower heads. If you wait until the flower heads are somewhat dry, then cut them off and put them in a small paper bag or paper envelope, the flower heads will dry further and you’ll find seeds have fallen to the bottom of your bag or envelope. I have found that not every flower head produces seeds, and the yield varies greatly from year to year (weather conditions I suppose), but if you collect several heads, you will usually get a few seeds. It is spring in New England and I am cleaning my gardens getting ready for everything to “pop” up. I planted Bee Balm last year and loved it next to my tall Phlox. Everything is coming up nicely but I cant tell if the Bee Balm is coming back up…it seems to have a more vine plant like spreading around it…directly around the old stems (and the only place in the garden this “weed” is growing if it is indeed a weed.). I don’t want to “weed” it up if it is actually the Bee Balm. By any chance can you tell what it looks like in the spring as it is returning? Thanks! A Moss, your bee balm may be spreading underground through the rhizomes… the horizontal stems produce roots every few inches and form new plants wherever they have rooted. I keep finding new bee balm where I didn’t want it to be, and usually I can trace it back to the original plants through these rhizomes. Interesting about all the different names, isn’t it? Thank you so much for the information. It more than answered my question. I am glad that I found this site.